Here is our weekly CRC Davis newsletter! Happy Valentine Day! You See Davis (YSD) is one of our club’s biggest events of the year, where we invite Interactors to come to UCD to learn about Rotaract, Davis college life, leadership skills, and much more! We need plenty of hands on deck to help plan YSD. If you’re interested in developing your leadership skills, bonding/mentoring high schoolers, or learning about event planning, this is for you! Join our YSD committee and get involved in the subcommittees we have. Information about the subcommittees is listed in the sign up link! The annual Rotaract Conference is coming up March 24-26. There are 80 scholarships available for those who would like to attend the event. The three day conference will be filled with guest speakers, workshops, and numerous opportunities to network with other Rotaractors, Interactors, and Rotarians. Please register online. It’s Valentine’s Day! Take a selfie with someone you love! If you are interested in buying one, fill in the form below. The ultimate bake sale! Let’s sell the pocky sticks we just made as a fundraiser at the MU! Come break the ice with us! If you need a ride, we will be meeting at MU tennis court. Come out to our SECOND District Event! We will be getting together with other Rotaract Clubs in our district to make water pasteurization indicators, and give you a chance to network. Come out to help us hand sew baby bibs and caps for our care packages to send to mothers with newborns in third-world countries. No sewing skills necessary! Come help clean up the creek! Here is our weekly CRC Davis newsletter! Make sure to stay warm in the cold! Davis and Santa Cruz Rotaract are having another joint social event, but this time in San Francisco! Meet Rotaractors from another club and enjoy a fun day of sightseeing, games, and of course food! Rides will be provided to all members. Sign-up for the mentor/mentee program with Interactors from Davis Senior HS Interact Club. This is your chance to inspire our youth in pursuing a higher education beyond high school as well as offering college preparedness advice. Lunch will be provided. This is Noon Rotary’s charity dinner to raise funds for the Child Abuse Prevention Program in Yolo County! Rides will be provided. We will need a lot of volunteers for this event, so please don’t hesitate to sign up! Here is our weekly CRC Davis meeting recap! Hello everyone! If you missed the meeting (every week on Tuesday from 7:10 – 8:00 PM in Giedt 1002), you can sign up for events through the links in this newsletter.Interested in learning more about a directorship or want to help out? Join a COMMITTEE! Sign up HERE and we will contact you! Thank you also for helping us donate $548.30 to the American Cancer Society from Relay for Life. What’s up everyone! Back at it again with Baby Packs this Friday! We’re going to continue sewing baby bibs and caps for care packages being sent to mothers with newborns in Brazil. If you don’t know how to sew, don’t worry, we got you! Help out the Noon Rotary Club by beautifying Central Park! Be a PAID MEMBER or BUY A SHIRT! Find a Finance director (Stephanie or Kaylee) at the meeting to pay. Shirts are $15 and membership is $20 for one whole year!This year’s shirt! What screams “Davis” more than a squirrel on a bike? Join a COMMITTEE! Learn about the ins and outs of a directorship (or all six) and work closely with the director(s). You will be able to gain experience, offer suggestions, and even run your own events. Sign up HERE and we will contact you! Join a FAMILY! We’ll put you in a family with other members and you will get to know everyone better, go to events together, and try to get more points than other families! Sign up HERE. WEEKLY SELFIE CHALLENGE:Take a selfie with whatever/whoever we choose that week and post it on the Facebook group or Instagram. Remember to tag us on Instagram @davisrotaract so we see it! Winners will be chosen weekly and will win a prize! Winners must be present at the meeting to receive the prize. SUGGESTION OX: Have suggestions or comments? Send them to us HERE. All responses are anonymous. For information on the club, who we are, and the board of directors,check out our website! Join our FACEBOOK group to see updates, reminders, and to post your own questions or suggestions! Post your weekly #selfiechallenge submissions in the group so we can all see your pictures! Follow us on Instagram for pictures of events and to see what our weekly Selfie Challenge submissions! Take a selfie with whatever/whoever we choose and post it on Facebook or Instagram! 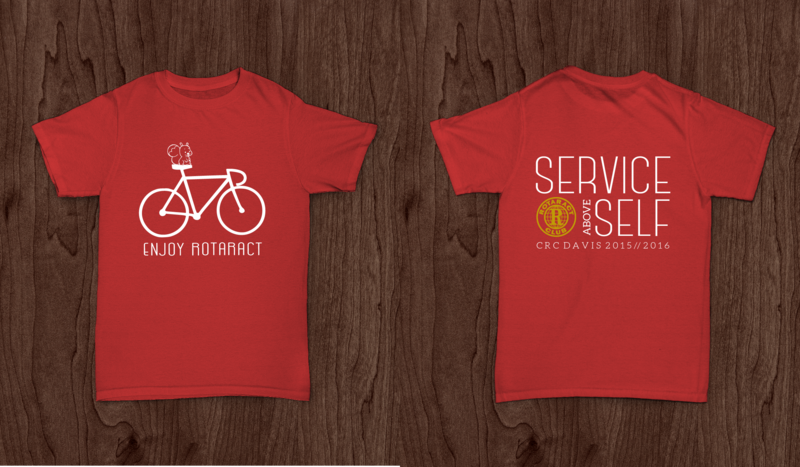 Make sure to tag @davisrotaract! We’re on Tumblr! Check us out for even more pictures and posts! Hello everyone! If you missed the meeting (every week on Tuesday from 7:10 – 8:00 PM in Giedt 1002), you can sign up for events through the links in this newsletter. Interested in learning more about a directorship or want to help out? Join a COMMITTEE! Sign up HERE and we will contact you! No Board Meeting Monday, 5/30; Happy Memorial Day! This is the last FAF of the quarter, and the year! We’re going to finish sewing baby bibs and caps for care packages being sent to mothers with newborns in Brazil. If you don’t know how to sew, don’t worry, we got you! Help out the Noon Rotary Club by maintaing Central Park and beautiful our community! Be a PAID MEMBER or BUY A SHIRT! Find a Finance director (Stephanie or Kaylee) at the meeting to pay. Shirts are $15 and membership is $20 for one whole year! This year’s shirt! What screams “Davis” more than a squirrel on a bike? Hey everyone! One of our biggest service events is coming up! 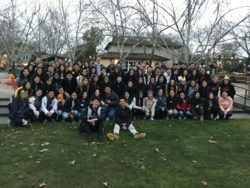 The annual Rotary Barbecue in Central Park, hosted by the Davis Rotary Clubs and the Campus Rotaract Club, is a major fundraiser for the youth groups in Davis. There will be many time shifts, each one having different types of jobs such as setting up, working at stations, serving food, and cleaning up. Volunteers are required to work a minimum of two hours, but volunteers who work three or more hours get a free meal! Please wear your Rotaract shirt if you have one 🙂 Rides will be provided. Celebrate the great year we’ve had in Rotaract at our End of the Year Banquet. Tickets are on sale now at $10 for paid members, $25 for non-members. If you’d like buy a ticket, please see Kaylee or Stephanie. We accept cash, check, Venmo, or online payment through Universe. Please fill out the google form so we can generate a guest list. Come out to the Board of Directors’ weekly board meeting! If you have applied for a board position for next year, it is especially helpful to come find out what exactly we do and how we conduct club business! The Pie an Officer Auction will be next Tuesday at our general meeting! Come to the meeting with your form of payment (cash, check, venmo) if you’d like to pie one of the officers in the face (payment is due on the spot)! How the point system works for membership: You get one point for every event you go to, and an additional point for every hour of service completed. So if you attend an event at the Mondavi Center, you receive 1 point. Working there for four hours means an additional 4 points for a total of 5 points! Sign up for a shift or two to help sell the delicious pocky sticks we made, while hanging out with some of your favorite people! All you can eat, grill-it-yourself Korean BBQ. Need I say more? Come out to the Elk Grove Oz location this Friday the 13th to treat yo’self to some amazing food at our fundraiser! You must present a flyer to the cashier. Hey guys! Categories for the end of the year gag awards have been voted on, so now it’s time to nominate people! Nominations close on Sunday, May 15 at 11:59PM. Voting and winners announcements will take place at the banquet. What’s up everyone! Back at it again with Baby Packs next Friday too! We’re going to continue sewing baby bibs and caps for care packages being sent to mothers with newborns in Brazil. If you don’t know how to sew, don’t worry, we got you! Attention graduating seniors! If you are attending the End of the Year Banquet and wish to be recognized and honored at this event, please fill out the Senior Send Off form, so we may give you the proper goodbye you deserve. Deadline to fill it out is Friday, May 6th at 11:59PM. Show off your Rotaract pride at graduation with our stoles! They’ll be sold for $20 each and distributed at the End of the Year Banquet. If you’d like one, please let Kaylee or Stephanie know. SELFIE CHALLENGE: This week’s selfie challenge is Mother’s Day! Take a selfie with your mom, grandma, aunt, or any other mother figure in your life and post it on FB, Instagram (tag @davisrotaract and #selfie challenge), or send it to [email protected]. It’s MAY! Come and work out! Midterms and Finals are going to get hectic, so come relieve some stress and work out. This is a great way to end the quarter, by treating your body with a nice workout and going through some pain with a friend! FAF is back this week with Baby Packs! We’re going to continue sewing baby bibs and caps for care packages being sent to mothers with newborns in Brazil. If you don’t know how to sew, don’t worry, we got you! This BBQ will serve as a fundraiser for next year’s District Council and their projects. In the past, they have hosted various socials to subsidize Big West Conference costs for attendees. As such, we are asking for $10 from every attendee. Rotaractors and Rotarians will come together to eat, share stories, and play some board games and sports. Please RSVP below by Thursday, May 5th at 11:59PM! Come help coat some pretzel rods in chocolate and decorate them with us to sell for a fundraiser! We’ll be making them before the general meeting. You can take the M or W Unitrans line from campus if you bus! The Campus Rotaract Club of Davis Scholarship is now available here. It is open to all current paid members of the organization. We are awarding one (1) $400 scholarship (subject to change). If you have any questions, please contact Regina Mayta at [email protected]. The recipient of the reward will be announced toward the end of spring quarter. You will be notified once your application has successfully been received, and an interview will be scheduled for later in the quarter. Please fill out the application to the best of your ability and submit it by 11:59pm on Sunday, May 1st. Come show your support at the Habit Burger! All proceeds will be donated to Relay for Life. We have to show a physical flyer to the cashier, so please grab one at the meeting on Tuesdayor print your own off of our Facebook page! It’s time once again to break out your black slacks and white button ups for a fun night selling concessions at the Mondavi Center! Join us for 24 hours of fun at Russell Field to CELEBRATE the lives of those who have battled cancer, REMEMBER loved ones lost to the disease, and to FIGHT BACK against a disease that takes too much. Instructions on sign-up: Sign up for a team. Choose between “Rotaract 1”, “Rotaract 2”, or “Rotaract 3.” Each participant pays $10, which will go to American Cancer Society. This BBQ will serve as a fundraiser for next year’s District Council and their projects. In the past, they have hosted various socials to subsidize Big West Conference costs for attendees. As such, we are asking for $10 from every attendee. Rotaractors and Rotarians will come together to eat, share stories, and play some board games and sports. 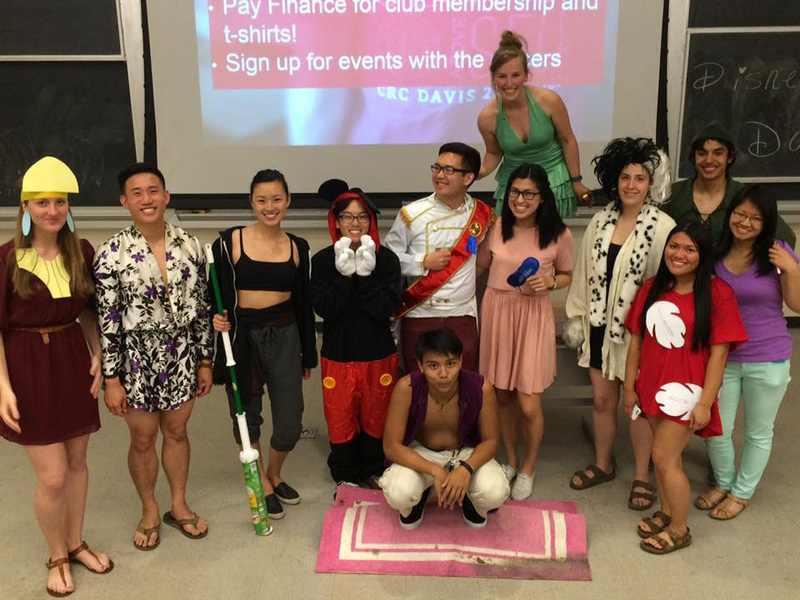 The Rotaract Board of Directors dressed up as Disney characters at tonight’s general meeting! This marks the beginning of the rewards that the club earned (by raising a specific amount of money at the Board Auction last quarter)! Come out to the general meetings to get in on the fun; a few of the things we’re doing include bringing baked goods, dancing to “Daddy” by Psy, and playing Egg Russian Roulette! Hope to see you next Tuesday! The Campus Rotaract Club of Davis Scholarship is now available here. It is open to all current paid members of the organization. We are awarding one (1) $250 scholarship (subject to change). If you have any questions, please contact Regina Mayta at [email protected]. The recipient of the reward will be announced toward the end of spring quarter. You will be notified once your application has successfully been received, and an interview will be scheduled for later in the quarter. Please fill out the application to the best of your ability and submit it by 11:59pm on Sunday, May 1st. Sign up for ASSASSINS here! One sentence description: Kill or be killed. More details and rules are on the Facebook group. Deadline to sign up is Friday! Our first FAF of the quarter will be baby packs! Come out to help us hand sew baby bibs and caps for our Baby Packs project, which is to put together care packages for mothers with newborns in third-world countries. The Cannery project that we helped out during Fall is partnered with the Yolo Food Bank, and we are helping them out with their first annual race event that will benefit the Davis School Foundation (a 501c3 organization that raises funds to support all public schools in Davis). Rides will be provided. Let’s help out the runners at Stride for Aggie Pride! POT LUCK! Bring food! Let’s all eat together and have a family dinner! More details to come. Come show your support at the Habit Burger after next week’s general meeting! All proceeds will be donated to Relay for Life. We have to show a physical flyer to the cashier, so please grab one at the meeting or print your own off of our Facebook page! Sign up for a team. Choose between “Rotaract 1”, “Rotaract 2”, or “Rotaract 3.” Each participant pays $10, which will go to American Cancer Society. Keep your morning for the toughest projects. If you have class in the mornings, try to do homework as soon as you get home. It’ll help free up your evenings and avoid procrastination! Mentor/Mentee sign-ups are now available here and can be submitted until tomorrow night (4/13) at 11:59PM! There will be a mentor/mentee reveal night next week; sign up if you’re interested in getting to know someone better, learning about another’s experiences in and out of Rotaract, or making a new friend! Sign up for ASSASSINS here! We will be making signs and decorations for our Picnic Day Food Booth! This is the day where you find out who your mentor or mentee is! We will play fun games, go out to dinner, and potentially star gazing afterwards in the arboretum. Join Rotaract’s Board of Directors at their weekly board meeting! If you have applied for a board position for next year, it is especially helpful to come find out what exactly we do and how we conduct club business! The Cannery project that we helped out during Fall is partnered with the Yolo Food Bank, and we are helping them out with their first annual race event that will benefit the Davis School Foundation (a 501c3 organization that raises funds to support all public schools in Davis). Exercising regularly helps you keep an active mind! A tip to help build this routine would be to work out early in the morning before it escapes your to-do list.